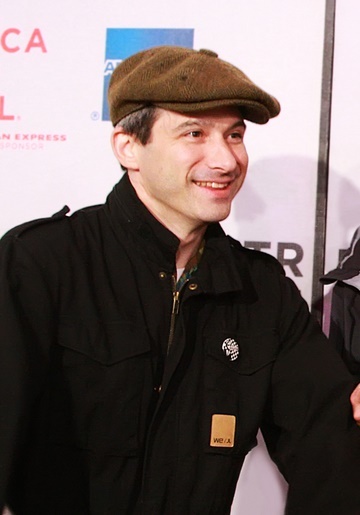 Ad-Rock, also known by his birth name, Adam Horovitz, is an American musician, guitarist, rapper, producer, and actor. He was a member of the hip hop group Beastie Boys, in which he played the guitar. Other members included Mike D and Adam Yauch. Ad-Rock is the son of Doris (Keefe) and Israel Horovitz, a playwright, director, and actor. His sister is producer Rachael Horovitz. His father is Jewish. His mother is of Irish Catholic background. Ad-Rock’s paternal grandfather was Julius Charles Horovitz (the son of Israel Horovitz and Bessie S. Binsky). According to the census records, Israel and Bessie were both born in Russia. Israel’s profile on geni.com says that he was born in Romania. Bessie was the daughter of Isaac Binsky and Sara. Ad-Rock’s paternal grandmother was Hazel Rose Solberg (the daughter of Natan/Nathan/Nattan Solberg and Mabel/Mabele Becker). On the 1920 census, Natan and Mabel are both listed as being born in Poland. On the 1930 census, Natan is listed as being born in Russia, while Mabel is listed as born in Latvia, to German-born parents.